TRACC's steady stable growth since 1996 is a prime example of forward-looking sustainable development. A powerful economic asset for the Province as a whole, TRACC is a recognized leader in New Brunswick's environmental industry sector. At the community level, our impact also goes well beyond job creation and technical innovation. The company's involvement in non-profit social programs such as Habitat for Humanity is a clear example. Today, TRACC's strong support for 'HFH' construction extends all the way from Central New Brunswick to Central America. Multi-family dwellings such as the one pictured here are among the wide variety of projects we've been active in over the years. 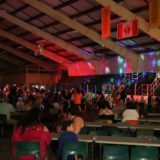 TRACC has partnered with the Village of Minto to support many initiatives, including donating roofing for various community buildings, supporting the annual hockey tournament, and hosting the annual TRACC Family Fun Night dance that brings more than 400 people out to celebrate Canada Day weekend, win prizes, and enjoy an evening of fun with their family – all for free! TRACC has sponsored Science East in various ways, such as sponsoring free public events for families to learn about recycling, and donating an entire roof for their center. TRACC has been a long-time sponsor of Habitat for Humanity, donating items such as roofing, rubber matting, and other material to various projects throughout the province. At the local level, support for sports, fitness and recreation programs has always been a strong focus for TRACC, and its people. 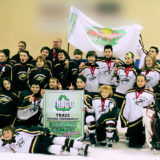 Company-sponsored hockey tournaments and individual team coaching efforts are among the many ways we constantly strive to ensure TRACC's presence in our home community is both beneficial and productive.